Use the Winco PF-32 Plastic Funnel, 32 oz. when you pour from large bulk containers into smaller bottles and bowls. 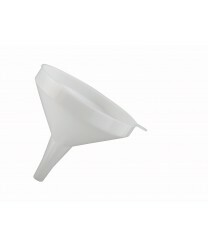 Made of durable, break-resistant white plastic, this 32-ounce funnel can handle the rigours of commercial food prep. Perfect for refilling tabletop bottles of ketchup, salad dressing, soy sauce and more, this versatile, mess-free funnel washes up beautifully and has a convenient hang hole for storage between uses.